A little sci-fi by me! The “cauldron” to the left is a nano-factory, able to produce a set range of objects by the use of ambient energy and trace materials. The glowing book on the pedestal is able to gradually change the brain function of those who spend enough time reading it. And the telephone to the right is able to resurrect the recently dead – at least some of the time. We also see a glimpse of the Energizer that fully recharges a sim in a matter of minutes using only electricity. Artificial intelligence never lived up to its promises. The Age of Transcend therefore began around 2045, when adventurous sims began implanting multiple wireless computer interfaces in their brains. Through these, main parts of their brains had access to virtually unlimited knowledge, processing power, pure logic and funny cat pictures. At first, insanity and death was common, one often leading to the other. But the survivors used their greatly enhanced skills to solve the problems, and around 2050 it was becoming safe to become such a greatly augmented human. From now on, they used their superhuman skills to improve their superhuman skills, and by around 2055 had reached the level of “Weakly Godlike Superintelligence”. At this point, any discoveries and inventions they made were impossible to explain to a mere human, although they could certainly be demonstrated, and in a few cases even copied by slavishly following the template given by the Transcend. It was also in 2055 that the Transcend, as they were now collectively named, invited anyone who wanted to join their rank. Perhaps surprisingly, most sims preferred to stay on a merely human level – or perhaps they just never got around to do anything about it. In any case, only a tiny minority joined the Transcend, although the number was more than an order of magnitude higher than the 144000 later bandied about by legends. Some historians think as many as one in thousand joined the Transcend, and it was invariably the most talented, adventurous and creative who did so. 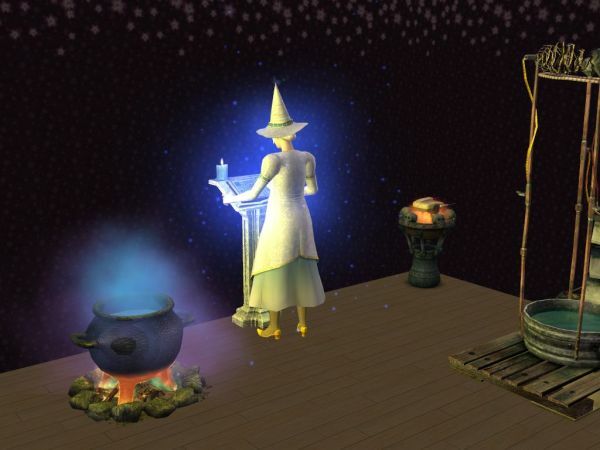 During this third phase, the Transcend had little to do with ordinary sims. Whatever they did, it took place in virtual realms, or in outer space, or in other dimensions. They left the world alone – and eventually, in 2060, they left the world altogether. After announcing “Our work here is complete”, on the night of Passover, 2060, all the Transcend disappeared bodily from Sim Earth and were never heard of again. Whether “here” referred to this planet, this galaxy, this universe or even this general type of universe, they were gone without a trace. Well, apart from the few mysterious inventions they had deigned to share with simkind five years ago, known from now on as “Transcend relics”. Intentionally, perhaps as some kind of joke on our expense, these objects were frequently made to look like arcane items from folklore: Wands, broomsticks, grimoires, cauldrons. But they also left behind a substantial medical knowledge, advanced robotics, and the technology of teleportation. The world after the Transcend was a strange place: Bereft of almost all genius, it became a thoroughly mundane place, technologically stagnant yet prospering by the few crumbs fallen from the table of those who had left us behind. “Any sufficiently advanced technology is indistinguishable from magic.” -Arthur C. Clarke. “Any technology, no matter how primitive, is magic to those who don’t understand it.” -Florence Ambrose. This entry was posted in fiction, writing by itlandm. Bookmark the permalink. Don’t you think that among the non-Transcend, occasionally the spark of human genius would appear? Rather at a similar frequency as early, early civilizations? And then they could, possibly, after a few thousand years, basically do the whole thing over again? Yes, actually the Sparks are the main characters of the sim story that started with this introduction. ^_^ But they will live in the shadow of the Transcend for thousands of years until the magic fades from the world and even myth is forgotten.